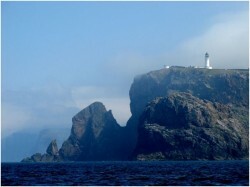 Starting on the 22nd and finishing the 29th May, the Cape Wrath Ultra is taking 95 brave ultra runners on the journey of a lifetime through the wild landscapes of North-West Scotland. The race, organised by Ourea Events, and covering 400km of mountainous terrain from Fort William to Cape Wrath, the North-western most tip of the UK. The Cape itself is only accessible by foot or boat, and the route is regarded as the toughest long distance trail in Britain, normally taking walkers around 20 days, though few have the experience to even attempt it. The route has been devised by Shane Ohly of Ourea, and Gary Tompsett, who has been appointed Race Director and planner. Tompsett was the planner of the 2007 AR World Championships in Scotland and he’s been refining the new 400km ultra route to take competitors through a mountain landscape unlike any other in the UK. The total ascent will be 11,200m but that figure does not fully take account of the toll the constant ups and downs and difficult foot placement will take. River crossings could be a particular hazard, the weather could do anything from blizzards to a heatwave, and everyone has been warned to check the ‘midge forecast’ as these tiny biting insects can really make their presence felt. All competitors and ground staff have been supplied with YB Tracking devices. These personal, two-way satellite tracking and communication devices are the only reliable way to monitor the progress of the racers while they’re travelling through such remote wilderness. YB Trackers will be providing accurate, real-time, information about competitors directly to the event website.